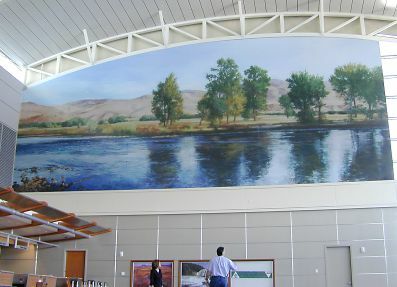 The other major work is the mural at the west end of the departure hall, depicting the view from the south side of the Boise river, looking to the foothills. It's a lovely landscape, and definitely of its place. The piece is titled "River's Edge," and is by Geoffrey Krueger. Click the image for a detail view of part of the mural.